Hearthstone: Most popular Legendary cards from first day of Rastakhan's Rumble – AiPT! Which Rastakhan’s Rumble Legendaries have been most prominent on Day One? Hearthstone‘s latest expansion, Rastakhan’s Rumble went live earlier today and already ladder-grinding fanatics and theorycrafters the world over are fine-tuning their decks to figure out which new configurations will rule once the dust settles in the new meta. Interesting to note? 4 out of the 5 new most popular Legendaries are from the Beast tribe. 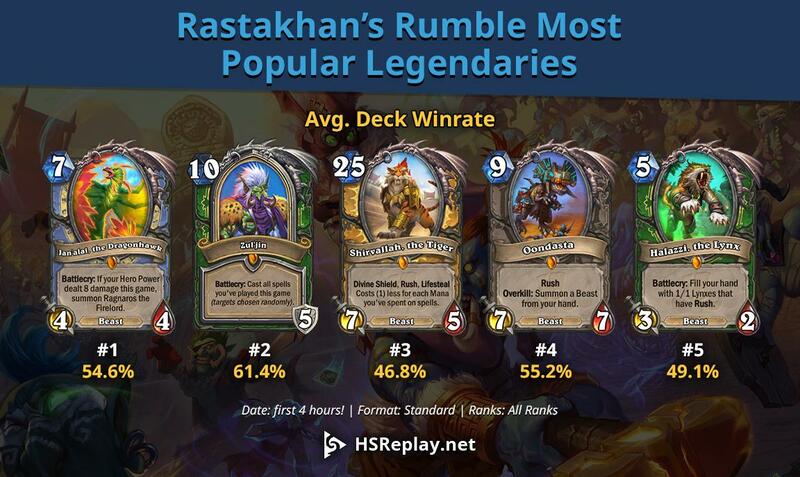 This doesn’t necessarily mean these Legendaries are the best, however; the Rastakhan’s Rumble meta is still being figured out, so the cards players were most eager to use in the first four hours of the expansion’s release could very well turn out to be duds. Or maybe not. We’ll see. Which new Legendary card has been your favorite thus far in Rastakhan’s Rumble?